U.S. Soccer Development Academy 2017 Summer Showcase and Playoffs will be played at Grand Park in Westfield, IN June 20-26. Knockout Round games are slated for July 6 and 7 at the host locations. The 2016/17 Development Academy season will conclude at the National Training Center in Carson, CA with the Academy Championships on July 14 and 16, 2017. CHICAGO (Feb. 9) The dates for the event have been selected based on survey responses, feedback from clubs, academic calendar/schedule and to maximize the safety and experience for all our players and clubs. Once again, the event will host the U-14, U-15/16, and U-17/18 Development Academy age groups. 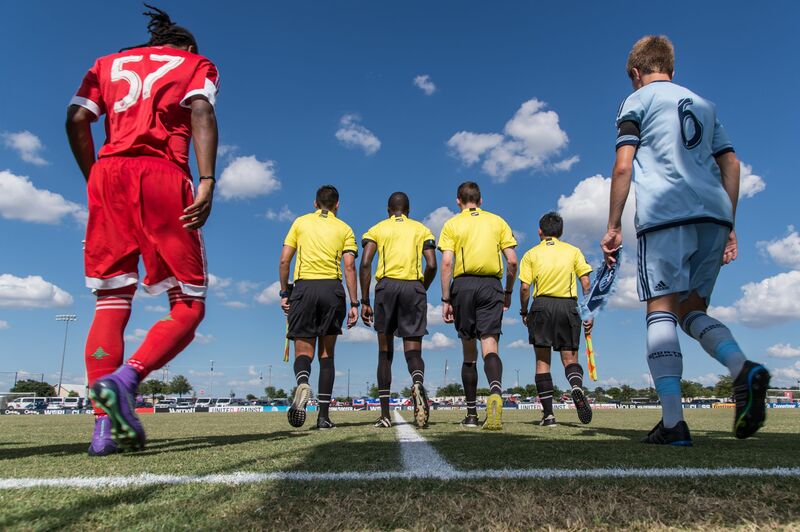 The benefits of continuing the combined Showcase and Playoffs schedule include an improved schedule and environment for all Academy clubs, players, scouts and spectators. By combining efforts and resources, it allows Academy Directors the ability to attend all of their club's games. Having the age groups overlap also provides opportunities for elite players to play up with older age groups in Showcases, which feature meaningful, hand-picked matchups. The U-14 games will be held June 20-23 with June 22 as the rest day. The U-15/16 and U-17/18 playoffs will be played on June 22, 24 and 26; the rest days for playoffs will be on June 23 and 25. This schedule is designed in the best interest of player well-being and quality of play according to U.S. Soccer Medical and Technical Staff. The remaining U-15/16 and combined aged Showcase games will be played over 4 days from June 22-25 with half of the teams resting on June 23 and the other half resting on June 24. The Showcase games are for all U-15/16 teams that do not qualify for playoffs. If both the U-15/16 and U-17/18 teams do not qualify, the club may bring one combined aged team of U-15/16/17/18 players, which will play against similarly-aged combined teams. For a calendar overview of the postseason schedule click here. For a list of all Academy events for 2017 please visit the events webpage. After winning their groups during the Playoffs and advancing through the Knockout Round, the 2016 Development Academy Championships saw FC Dallas emerge as the winners in both the U-15/16 and U-17/18 age groups. It was the first time a single club has swept the championships in both age groups in the same year; FC Dallas also became the first club to repeat as champions in an age group, having also won the U-15/16 championship in 2015. The U-17/18 age group also saw Vancouver Whitecaps FC, Players Development Academy and Nomads SC qualify for the championships. In the U-15/16 age group, LA Galaxy, Real Colorado and Chicago Fire rounded out the Championship field. U.S. Soccer Development Academy partner Anthony Travel is available to assist clubs with their travel accommodations (hotel, airfare and rental vehicles). Anthony Travel has made every effort possible to contract and obtain the lowest rate and best deal possible with the area hotels that include terms necessary to protect the teams. Click here if you would like to learn more about the benefits of booking with Anthony Travel. You may book your team reservations by visiting the Anthony Travel website listed below or by calling their office at 1-800-736-6377. In addition to being available via phone, you may also email soccer@anthonytravel.com if you have questions or need additional assistance. For assistance with airline or car/van rental reservations, you may also contact their office at 1-800-736-6377 or email at atidallasagents@anthonytravel.com. For additional information visit the Anthony Travel website.